1 – Material: What is in contact with the Motorized Roller? 2 – Product weight: What will be the maximum weight? 3 – Available voltage: What voltage are you using? 4 – Desired transportation speed: How fast do you want to move the article? 5 – Diameter of the roller: What diameter are you looking for? 6 – Between frame dimension: What is your between frame dimension (BF)? In determining the correct length of the Power Moller required, you should first obtain the between the frame width of the conveyor you will be mounting the Power Moller in. All dimensions need to be converted to millimeters. 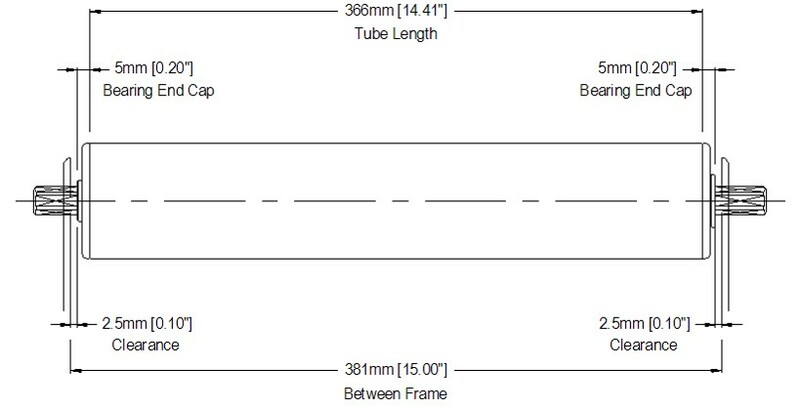 Take the between the frame width and subtract 15mm to account for bearing end caps and clearances to achieve proper tube length. Subtract 21mm when using the “JQ” type shafts. For IP-G and HP-G rollers, deduct 35mm. 7 – Options: Does the application call for any special options? Tangential force is the force in lbs. that is needed to move the item on the conveyor. The force tangent to the roller’s surface. The above values are based on industry standards of products with a smooth, uniform bottom surface in contact with the roller. Given W = 25 lbs. TF = 0.11 X 25 lbs.